1) The possibility of elevated measured end-tidal CO2 (sometimes >80 mmHg). 2) Significant absorption of CO2 in tissue and the vascular system during long procedures, leading to a drop in the pH. However, even a PaCO2 of 130 to 160 mmHg (even up to 250 mmHg), in healthy volunteers, has been shown to be well tolerated.1 In the case of gastrointestinal endoscopy, the clearance of insufflated CO2 from the gut is much more rapid than it is for air. The American Society of Gastrointestinal Endoscopists (ASGE) has published a Technology Status Evaluation Report that discusses in depth the risks and benefits of CO2 insufflation.2 A robust bibliography is cited, and 36 randomized controlled trials (RCTs) are discussed that speak to the high safety profile for CO2 insufflation.2 Most of these excluded patients with pulmonary disease, yet three studies did compare CO2 insufflation in healthy patients versus patients with subclinical pulmonary dysfunction or actual COPD. These studies showed no difference in the rate of CO2 rise, peak CO2, or SpO2, but one showed a positive correlation for risk of CO2 retention with increased procedure time. Dr. Berry is right to warn providers about the associated CO2 elevations during longer endoscopy procedures. The study he mentions, Suzuki 2010 et al.,3 involves a specialized, advanced endoscopy procedure (esophageal endoscopic submucosal resection), with a median duration of 122 minutes and a rise in median PaCO2 value from a baseline of 28 mmHg to a peak PaCO2 of 39 mmHg. Thankfully, most upper endoscopies are far shorter (somewhere around 4 to 9 minutes).4,5 They can often be accomplished, as is largely the European experience, under minimal to moderate conscious sedation, or even under no sedation. 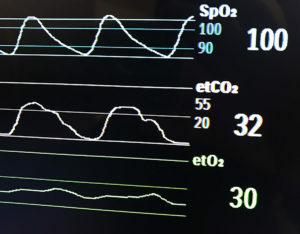 Current evidence suggests that CO2 insufflation is safe even in patients with COPD, but further RCTs would be helpful. Dr. Berry sagely advises caution and increased vigilance. Frumin MJ, Epstein RM, Cohen G. Apneic oxygenation in man. Anesthesiology 1959;20:787–798. ASGE Technology Committee, Lo SK, Fujii-Lau LL, et al. The use of carbon dioxide in gastrointestinal endoscopy. Gastrointest Endosc 2016;83:857–65. Suzuki T, Minami H, Komatsu T, et al. Prolonged carbon dioxide insufflation under general anesthesia for endoscopic submucosal dissection. Endoscopy 2010;42:1021–9. Demiraran Y, Korkut E, Tamer A, et al. The comparison of dexmedetomidine and midazolam used for sedation of patients during upper endoscopy: A prospective, randomized study. Can J Gastroenterol 2007;21:25–9. Pambianco DJ, Vargo JJ, Pruitt RE, et al. Computer-assisted personalized sedation for upper endoscopy and colonoscopy: a comparative, multicenter randomized study. Gastrointest Endosc 2011;73:765–72.